That's true. I haven't noticed any Locomotives in the UK with bodies made of metal. I guess it will be a bit odd first at first when I get my Bachmann Skarloey it having a metal body. It will feel like my childhood days again, with those die-cast metal ERTL Thomas & Friends trains again! I hope the paint won't be painted on that it could be easily chipped or scratched. That will annoy me a lot. I take it these pictures are supposed to be of the Red Coaches. Why won't these images display the picture for me? All it displays is a black out line if the image. I am interested in seeing them, as my Red Coaches have not been delivered yet. I will take your word for it Alex, but I am not going out looking to buy a Locomotive with a metal body for the sake of it. I will wait until I can get my hands on Skarloey myself when he gets released and when he comes into stock from the website I get my Bachmann Thomas & Friends items from in UK. I have horrible feeling that Skarloey is going to be very expensive looking at the RRP in US Dollars. What has to be remembered is that every model is pretty much put together by hand, and the smaller the detail, the fiddlier the model will be, and so longer will be needed to put it together. As an example, take a look at this page of a model commissioned by a UK shop. It has a never-ending number of parts and wires, all that need to be put in by hand. I believe that Skarloey is estimated in the region of £90 here in the UK. £90 for Siarloey is too expensive for me. That's a rip off, especially how small he will be. 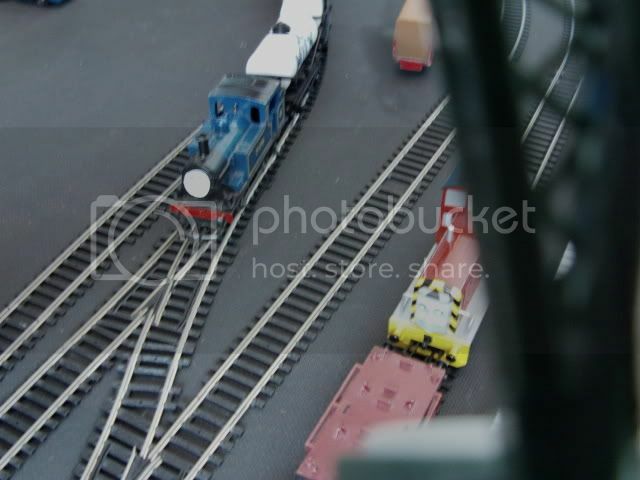 It is important to note that many highly detailed N or 009 gauge models (which is what Skarloey will be), sell for prices that are often higher than HO/OO counterparts, this usually due to the fact that N gauge is actually so small it is more costly during production to create toolings than in HO/OO, this is part of the reason why HO/OO is usually the dominant choices for UK, US, Australian and other worldwide buyers, as they tend to be cheaper at a higher detail than N gauge counterparts, and are usually cheaper and take up less room than O gauge counterparts, in the field of model trains it isn't always size that affects cost, I mean Z and TT gauges are often more expensive than HO/OO (again) and are smaller than HO/OO too. What must be remembered about pricing is that companies exist to make profit off of their goods so they can continue to employ their workers and make their goods in the first place. With a die-cast body and the smaller nature of N-gauge, Skarloey would make for a rather expensive production, meaning he will be sold at a higher price to recoup losses and gain profit. I can't honestly claim that I think this is a rip off, all things considered. Expensive, yes. Rip off? No, not to me at least. And the alternative to get a nicely detailed Skarloey railway would be through kit building, which would easily cost much, much more than the RTR model. That is true with the cost of the individual parts involved with the Locomotive, but I still feel £90.00 is still far too step. I could easily go and buy a large Locomotive at around £60.00, so it still too much. Size of the locomotive doesn't really determine the price. There's plenty of cheap large scale locomotives close to that price range. The price of an engine is determined by how many resources it takes to make that engine, how many units they've made, and how well they think it will sell. Size has nothing to do with the price of a model trains price; it's the quality. I know that is the quality rather than quantity, but as this stage, I think it problably £20.00 - £30.00 too expensive. I might think differently when I finally get it after it's release. Look at how small it is. All the parts have to be put on by hand, and the motor etc wired, again by hand. You work in the factory doing this day after day. Because it is so small, it takes longer to put together, as you have less space to fit everything into. Compare it to N gauge, and it isn't too badly priced; heck, even tank engines here in the UK are creeping up to the 3 Figure price mark. Some of my friends at my club also model in HOn30/OO9, Skarloey himself doesn't seem to be that bad compared to prices for other narrow gauge models in their collections. His price isn't what I'm worried about in regards to how the Skarloey range will do in sales. If anything, I think the rolling stock is too expensive since the regular Peco stock is a lot cheaper and even has the extra detail of a brake pipe. Despite that, I may pick up a couple of the vans to go with Skarloey, but I'm hoping to find them for a cheaper price than what I'm seeing in current shops that offer pre-order.